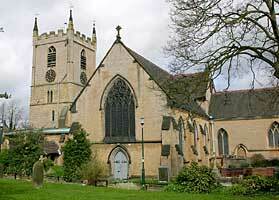 Built on the site of an Anglo-Saxon church it originally had a tower, nave, chancel and north aisle. The tower was constructed in stages between the 12th and 14th centuries. The lower stages of the tower are the oldest part of the building and are Early English. The nave and chancel belong to the same period as the tower. The north aisle is Perpendicular. A porch was built in 1320. The south aisle, in Perpendicular style, was added by Evans and Jolly between 1872 and 1874, and the transepts are by R C Clarke in 1887 and 1888. Clarke also moved the whole east end further east. The clock was presented by the Duke of Portland in 1884. The Lady Chapel was re-built in 1888. The Victorian baptistery housed the 14th century font until it was converted into a Visitors’ Centre. The church is best known for the Byron family vault, which includes the remains of the 6th Lord, George Gordon Byron, the poet, who died in 1824.